The advantages of E85 are more octane, latent heat of evaporation, cheaper price, clean burning, and availability. The biggest draw back is inconsistency of mix, slow burning, increased fuel volume needs, and yes availability. One of the things people like about it is the fact of the high octane rating. E85 is not 105 octane, it is 109 octane. Ethanol is 113 octane and gasoline is 87 octane, so an E85 mix equals 109 ((113 * .85) + (87 * .15)). E70 is 105 octane ((113 * .7) + (87 * .3)). This is why when you pull up to the pump the sticker reads minimum 70% ethanol and at least 105 octane. Another benefit to running E85 is that it produces 3% more power (on average). 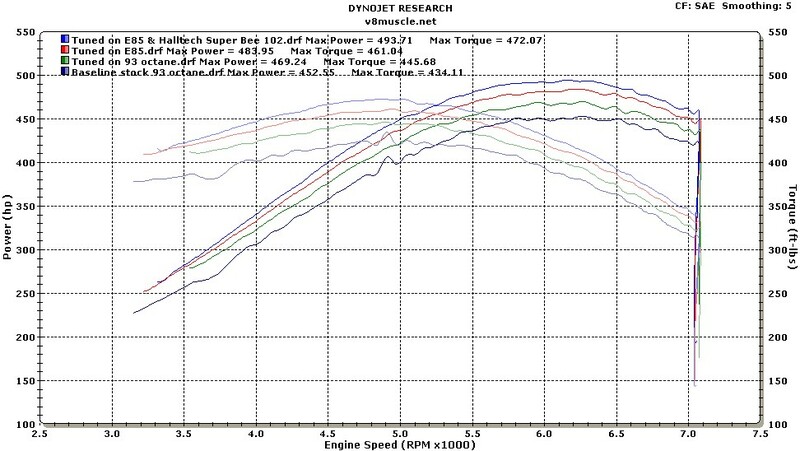 We found this to be true when testing it on our 2008 Z06 (see dyno graphs here). Latent heat of evaporation is a huge plus for blower cars with E85/E70. Pour some on your hand and you'll find that it is really cold. When a liquid evaporates, it draws heat energy out of whatever it is in contact with. The BTUs (energy) needed to evaporate ethanol are much higher than gasoline and therefore it really cools the intake tract, heads, and even the combustion chamber/pistons. In fact, it cools so well that we have to add gasoline to it to get it to fire off in cold weather--hence the need to add more gasoline to the mix during the cold winter months (E70). Now, those are a few of the biggest reasons to run a E85/E70, but there are some other issues to consider. The need for a lot of fuel flow is a major concern. It takes an average of 30% more fuel capacity to run it. This could mean needing a bigger pump, injectors, or even rails/lines/regulator. If you have a car that runs a stand alone fuel system for the nitrous then you can get by with some good injectors and a halfway decent pump as you have a second pump to help out with fuel requirements. Same goes for a blower car running a meth kit. What may be the biggest drawback is the change of stoichiometric value with the changing ratios of pump ethanol/gasoline mixes. Gasoline has a stoich value of 14.7:1. This means we need 14.7 parts air to one part fuel. Stoich for ethanol is 9:1, meaning you need a lot more fuel for the same amount of air. Now keep in mind the stoich value for E85 is 9.84:1, but for E70 it is 10.68:1. If you tune with E85, you'll be rich with E70. Likewise, tune with E70 and you'll be lean with E85. The only saving grace is, unlike gasoline, ethanol has a huge window when it comes to the wide open A/F ratio it likes. So, these are just a few key factors to consider in determining if E85 is right for you. Speaking strictly for performance reasons, we think it's hard to beat!